In Abu Dhabi, make sure to bask in the majesty of Sheikh Zayed Mosque before exploring the cavernous Marina Mall located along the scenic waterfront of Corniche Road. Stretch out on the sunlit beaches of Seychelles or spend the day visiting Port Victoria’s botanical gardens and colorful covered market. Link up with some lemurs at the Lokobe Reserve in Nosy Be or visit the volcano of Nosy Komba. Then sail off to South Africa’s Mossel Bay, where the beaches beckon those looking to relax and the Cape St. Blaize Lighthouse invite the architecturally curious. DUBAI, UNITED ARAB EMIRATES – Experience the blending of traditional Arab culture and modern western culture in Dubai. Gaze skyward to see the tallest building in the world, the 2,722-feet-high futuristic Burj Khalifa tower, or walk over to the impressive Jumeirah Mosque. Seek out jet-set haunts or stroll through the heart of the old city, Dubai Creek, which is home to the Dubai museum as well as the labyrinth alleyways of gold, spice and textile souks, where bargaining is part of the fun and ritual. ABU DHABI, UNITED ARAB EMIRATES – The world’s richest city boasts a wealth of culture, history and adventure, from the emirate’s old souks, where you can sip a fragrant Arabic coffee, to the rush of the world’s fastest rollercoaster. This 5,000-year-old metropolis is a fascinating mix of modern architecture and atmospheric back streets. Put your bargaining hat on for a friendly faceoff with the merchants at the souk to get deals on handicrafts, artwork, even spices and dried fruit for the cook back home. FUJAIRAH, UNITED ARAB EMIRATES – The only emirate on the Gulf of Oman rather than the Persian Gulf, Fujairah boasts beautiful, unspoiled beaches. The Hagar mountain range looms majestically behind the port and separates it from the rest of the country. Get a sense of Fujairah’s past at the archeological museum or its beautifully restored fort overlooking the old village and date palm oasis. Browse the souks for carpets and pottery and sample local delicacies such as salt-crusted hammour fish, a type of grouper. MUSCAT, OMAN – View Muscat from above by travelling on the Corniche and head out along the scenic Batinah coast. The medieval Nakhl Fort, perched on a rocky outcrop, offers magnificent views of the mountains and oasis below. The colourful Sultan’s palace and the Jelali and Merani forts are worth visiting, and if you seek to experience Omani culture, a stroll through the markets and narrow alleys is ideal. Exquisite local silver jewelry, exotic spices and handicrafts abound in the markets to tempt shoppers. PORT VICTORIA, SEYCHELLES – Take a sabbatical in the Seychelles capital of Victoria. Located on Mahé Island in the Indian Ocean, it’s famous for its exports of vanilla and coconut oil. Take a stroll through the Seychelle National Botanical Gardens full of flora, fauna and fruit bats. Stop by the Selwyn-Clarke Market for some street shopping. Try some local Ladob, a dish that can be served either sweet or savory. Then settle in for some sun at Beau Vallon Beach or visit the Navasakthi Vinayagar hindu temple. NOSY BE, MADAGASCAR – Immerse yourself in Madasgascar’s largest and most popular destination, Nosy Be. This “Big Island” off the northwest coast is famous for its natural splendour and Ylang Ylang trees that make up a major part of the local economy. Spend the day hanging out with lemurs and chameleons at the Lokobe Reserve. Indulge in local cuisine like the diverse and delectable variations of Laoka. Then brave the highest peak on the island at Mont Lokobe or relax on the beaches of Befotaka Bay. PORT LOUIS, MAURITIUS – Lose yourself in the Mauritian capital of Port Louis. 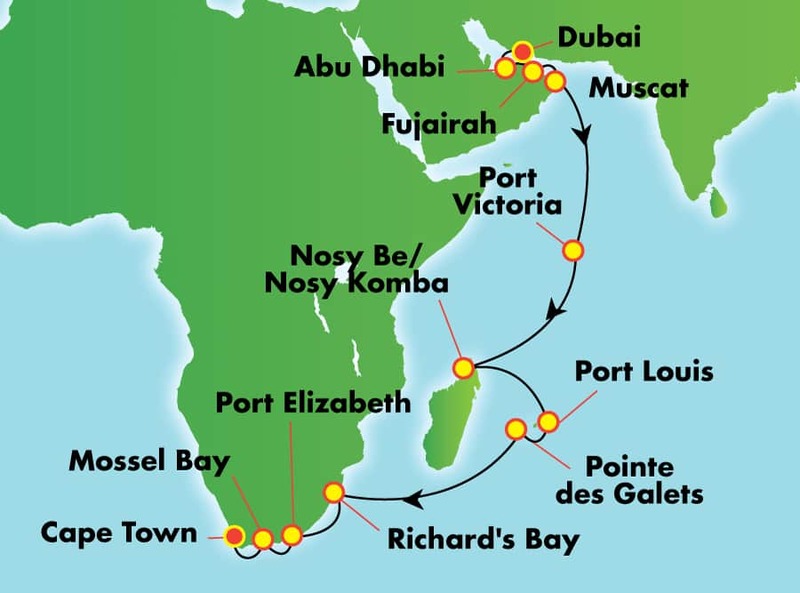 Named after a former French emperor, this port city was a major point of passage for ships sailing around the Cape of Good Hope. Visit the famous Champs de Mars race track. Learn about the local history and culture at the Blue Penny Museum. Walk through the gorgeous foliage in Les Jardins De La Compagnie. Then stroll along the Caudan Waterfront to check out the shops, restaurants and famous Chinese Pagoda. POINTE DES GALETS, REUNION – With its lush rainforests and beaches bordering coral reefs, Pointe des Galets, Réunion will dazzle you with its natural splendour. This island in the Indian Ocean is a French department and is known for Piton de la Fournaise, a climbable active volcano that rises to 8,635 ft. When you’re not hiking through the Bélouve Forest or laying back on l’Hermitage beach, you can visit the Aquarium of Réunion or stop by the Jardin de l’Etat, a botanical garden opened in 1773. RICHARD’S BAY, SOUTH AFRICA – Situated on the deepest natural harbour in the Southern Hemisphere, Richard’s Bay will thrill both nature and culture seekers. Spend the day walking through the Umlalazi Nature Reserve where you might see one of the rarest birds of pray in South Africa, the Palm-Nut vulture. Catch some sun or some waves at Aklantstrand Beach or learn about South African history and art at the Empangeni Museum. PORT ELIZABETH, SOUTH AFRICA – Port Elizabeth is one of South Africa’s major municipalities and bears the nickname “The Friendly City.” Relax on beautiful King’s Beach. Spot some big game at the Kragga Kamma Game Park nature reserve. Explore the rich history of South Africa’s Eastern Cape at the Donkin Reserve. Try local dishes like potjiekos, an indigenous stew cooked outdoors in a cast-iron pot. MOSSEL BAY, SOUTH AFRICA – Located along the Southern Cape, Mossel Bay is one of South Africa’s most popular tourist destinations. Sink your toes into the sands of Santos Beach. Hike up the trail to the Cape St. Blaize Lighthouse where the 19th century structure provides stunning views of the surrounding area. Learn about the earliest humans at the Point of Human Origins archaeological site. Then explore the more recent cultural heritage at the Bartolomeu Dias Museum. 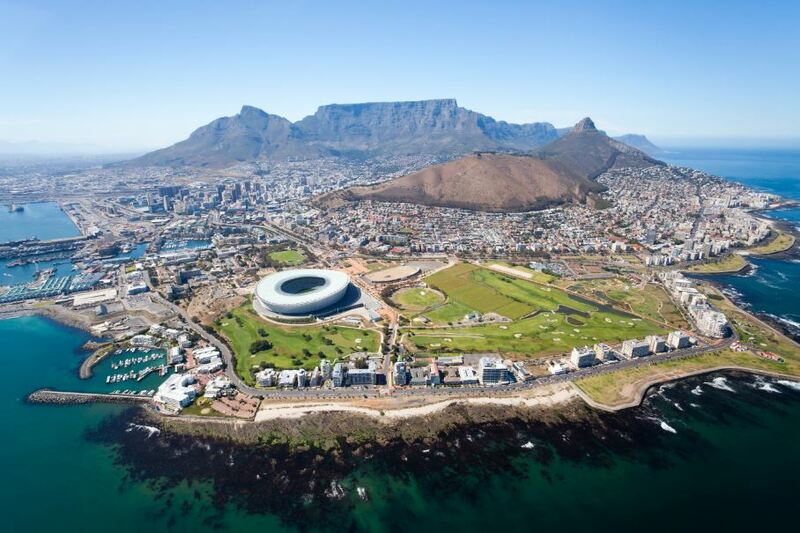 CAPE TOWN, SOUTH AFRICA – Cape Town is both the legislative capital of South Africa and one of its most vibrant cities. Make your way to the top of Table Mountain for panoramic views of the surrounding city and harbour. Visit Robben Island to see the former site of the notorious former prison that held Nelson Mandela. Explore the manicured lawns and beautiful forest in Kirstenbosch National Botanical Gardens. Then stop by the V&A Waterfront for some shopping and entertainment. BALCONY – Cat. BA $6,995 All above fares are subject to change without notice. Initial deposit of $500 per person. Final payment is due by: OCTOBER 22, 2019. 21-Day cruise aboard Norwegian SPIRIT. All your meals, activities and entertainment. Cost of airfare and transfers will be quoted when they are available with NCL.